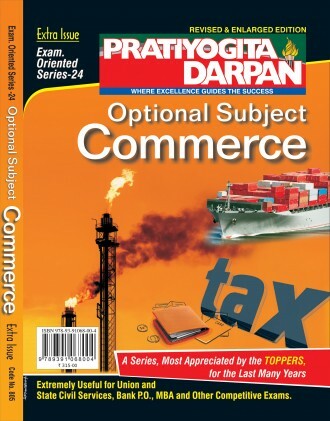 Optional Subject Commerce (English Magazine) is an extremely useful for UPSC and state civil services and other competitive exams with clear cut focus on topics like Accounting and Auditing, Business organization & Management. The study material is not only worth preserving herein but provides a wide perspective in giving precise explanation of the essentials of the subject of commerce. The scope and length in the coverage of the subject is determined by the current trends in the competition circles of the day. Hence the subjective and narrow minded traditional view which is more pedantic than practical and thus ignores the very realities and developments that are redefining the discipline of commerce has been avoided. Commerce is the very basis of life in that it is business, it is trade, it is what money is all about and what not it is the basis of our survival. Therefore the magazine set the benchmarks in glorifying the subject with sharp analysis on the deserving topics/chapters to enable the students to store in their memory the subtle points and core components of the discipline. The endeavor from the start till the finish in this magazine has been to keep alive to the needs of the readers who have been perseveringly reposing their trust in us in guiding them to the path of success. There is no beating about the bush, there is nothing curved and complex in subject matter; everything is laid bare in simple graspable framework before the students. Mastering the portions of Accounting and Finance Accounting, Taxation & Auditing, Financial Management, Financial Institutions and Markets hold the key to success for any aspiring competitor. The focus is to make the subject interesting and fascinating and thus instill the confidence among the students to motivate them to pick the subject as the choice of career. The description is balanced and categorical in the issue. The simplicity is its hallmark with notes of fresh information being inserted in between two major chapters in the edition. The question banks based on the study of the subject empowers the students transforming them into scholars who can command the subject from all round. Given the historic track record of Pratiyogita Darpan group our dear readers are in the full knowledge that this publication house does what it promise and as such the quality and vision as vehicles for all round growth of the students and competitors in form of compendium of knowledge is delivered. We earnestly hope that this small effort will be appreciated by one and all and will work as booster for us for bringing out best books /magazines again and again for you-our ultimate judge.